Valentine’s Day Chocolate Chip Cookie Hearts are the perfect easy Valentine’s Day dessert! Easy to make using pre-made cookie dough or your favorite cookie recipe! These heart shaped cookies will be your new go-to Valentine’s Day treat! Three things I love – Valentine’s Day, cookies and silicon molds. I kid you not, silicon molds are my newest obsession to bake and craft with! 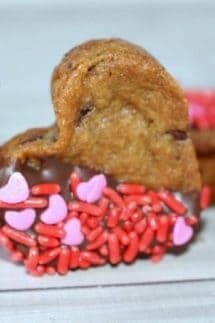 This is why these Valentine’s Chocolate Chip Cookie Hearts is the trifecta of perfection!! Not to mention, they are incredibly easy to make and pretty much “mess up” proof for those of you like me who can be cooking challenged! As you know, Valentine’s Day pretty much revolves around the ability to provide a yummy treat to your favorite Valentine. That is why Valentine’s Day cookies are a guaranteed win! The best news – you really don’t even have to do much more “cooking” than putting them in the oven. You can use pre-made cookie dough and then turn out fabulous (or if you are extra motivated, use your favorite from scratch chocolate chip cookie recipe)!! They also would be great with sugar cookies or any other type of cookie you and your Valentine love. 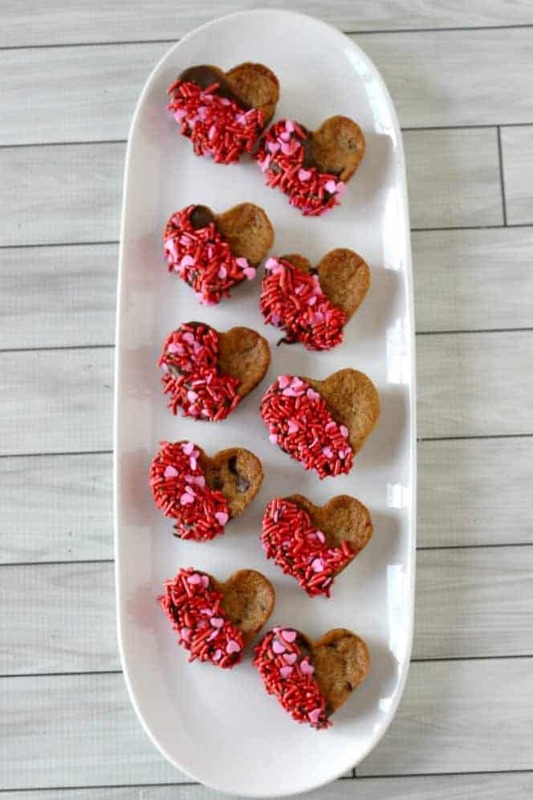 Get your kids to help you and great creative with the decorations and these Valentine’s Day Chocolate Chip Cookie Hearts can make a fun kids activity! 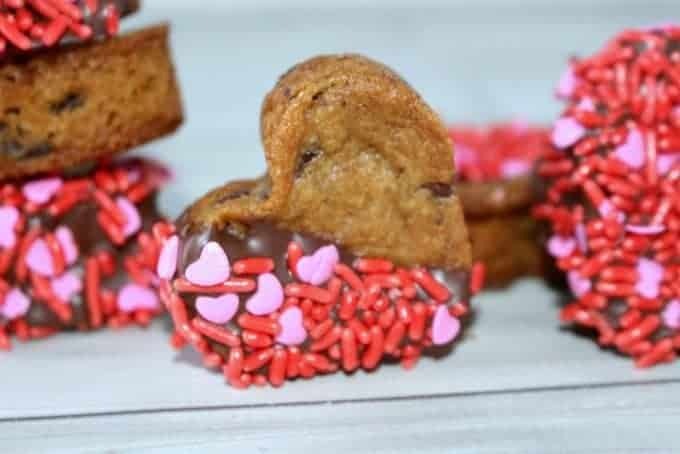 These Chocolate Chip Cookie Hearts not only make a really yummy treat, but they also make a super cute little Valentine’s gift for your friends and family! Fill each heart-shaped cavity firmly with the cookie dough (about 3/4 full). Make sure it is pressed down nice and tight. Place the mold on a cookie sheet and place in the oven for about 10-13 minutes or until sides begin to get golden brown. Take out of the oven and let cool COMPLETELY! Place the sprinkles in a small bowl and lay out the wax paper. Melt the dipping chocolate according to instructions on the packing. Dip half of the cookie in the chocolate and then immediately in the sprinkles and lay on the wax paper until the chocolate hardens. Valentine's Day Chocolate Chip Cookie Hearts are the perfect easy Valentine's Day dessert! 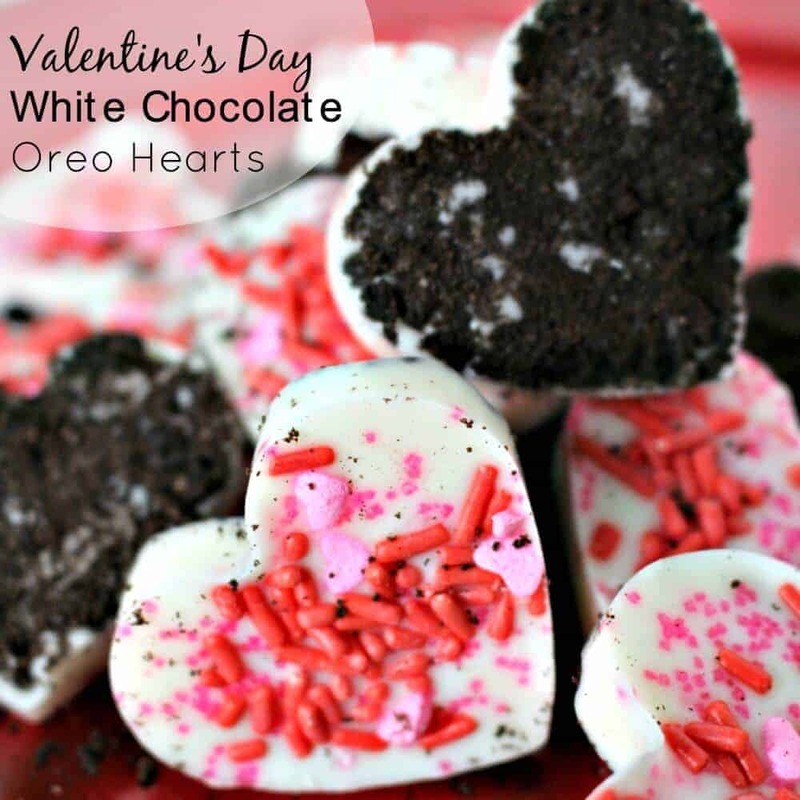 These Valentine’s Day White Chocolate Oreo Heart Bark is a favorite in my family. The great thing is, if you have the heart mold already, you can use it for this too! Different types of bark have become my new favorite and go to dessert. This Sweet and Salty White Chocolate Popcorn Bark is the perfect combination. 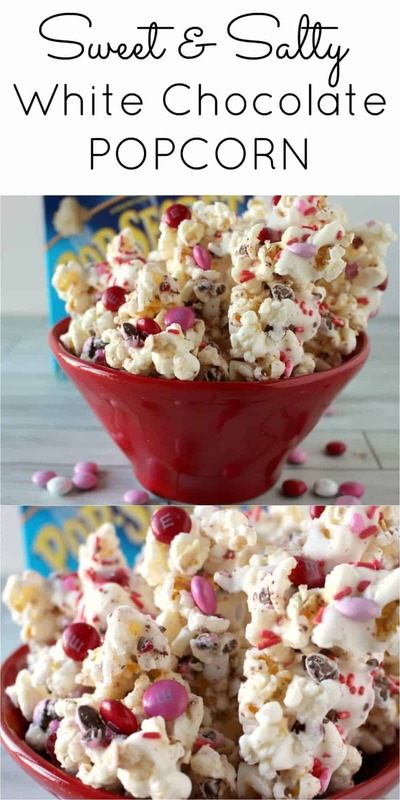 Put it in a cute tin or bag and serve it up for a yummy (and easy to make) Valentine’s Day Treat!! 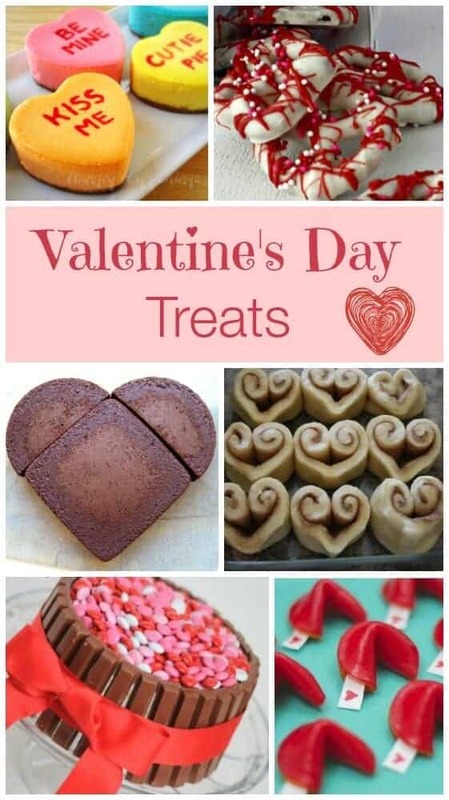 Not really sure exactly what type of treat you want to make for Valentine’s Day – no worries – here is a great round-up of some of the most popular Valentine’s Day treats around – check them all out and let me know which one is your favorite! Didn’t be spray the mold with nonstick spray first? Hello, what size were these molds?? How many squares did you use for each heart? Great project with my grand babies ! I tried this, but the center of each cookie sunk in the middle. It appears the cookie dough rises quite a bit, then flattens out, Since it can’t spread out, it pile up on the sides of the mold, but sinks in the middle. I used the Nestle package (but with the regular sized chips). Anyone else have this experience? This happened to me as well! Bummer, not sure if I should make anymore after that fail? maybe just settle on regular chocolate chip cookies. Oh no!! 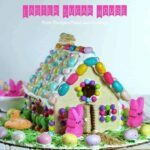 Not sure why they are falling – maybe there is too much batter in the mold? Mine had a little dip down in the middle, but nothing significant? SO SORRY! I just made these and they sunk in quite a bit too! I figured we could just eat them at home and I wouldn’t pass them out. But when I was taking the cookies out of the mold, they pretty much all fell apart! They had cooled completely and everything. I did not spray, but the directions say you don’t need to. Not sure what happened. Bummer!! Me too! Of course I’m at the 11th hour before school tomorrow! Oh no!!!! I am so sorry ladies! 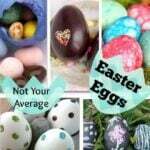 It really depends on the mold you are using! I have never had them stick! I used a small heart shaped cookie cutter. I used my own cookie recipe and put the dough in a small cookie sheet, then cut them while the cookies were warm. Super cute!! These are so freaking cute.